Minnesota’s median income grew faster than the national average over the past decade, as noted in part 1 of this series. And while Minnesota income inequality has increased, it has increased less rapidly than the national average. Meanwhile, in Wisconsin, median income growth fell short of the U.S. growth rate and income inequality increased at a faster pace. The divergent trends in the two states coincide with divergent policy directions. This analysis uses American Community Survey (ACS) estimates to examine changes in income levels and income inequality during the current business cycle, which began with the onset of the Great Recession in December 2007. To adjust for inflation, all amounts are expressed in constant 2016 dollars. * The income groups examined in the ACS and other information regarding the ACS were described in part 1. The 2016 income ranges for all six ACS income groups for the United States, Minnesota, and Wisconsin are listed below. Wisconsin has underperformed Minnesota and the national average in growth in median household income during the current business cycle. 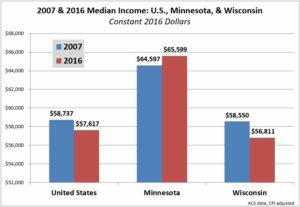 While Minnesota’s median income increased by $1,002 from 2007 to 2016, Wisconsin’s decreased by $1,739, and the gap between the two states widened from $6,047 to $8,788. 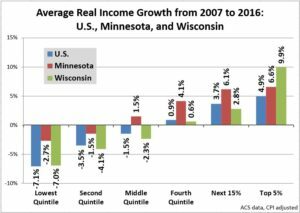 As in Minnesota and the nation as a whole, Wisconsin incomes declined during the Great Recession and increased during the subsequent recovery across all six ACS income groups. 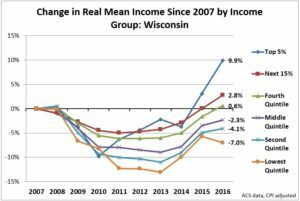 However, as of 2016, mean incomes in Wisconsin have yet to recover to the 2007 level for middle and lower income families with incomes below $70,482. Only the top 40% have seen mean incomes increase over the course of the current business cycle (through 2016). Across all income groups, Wisconsin income growth has underperformed the national and Minnesota averages, with one notable exception. The top 5% of households by income in Wisconsin saw income growth of nearly 10%—double the national average and well above the 6.6% growth rate for the same income group in Minnesota. Minnesota easily surpassed Wisconsin in income growth (or the absence of income decline) across all other income groups comprising the bottom 95% of the population. In both states, the rich got richer and the poor got poorer—although the trend is far more pronounced in Wisconsin. These changes in income inequality coincide with very different public policy approaches in the two states. Minnesota enacted progressive policies in 2014—specifically, increases in the state’s minimum wage and enhancements to the Working Family Credit. Reduced income inequality followed. The 2015 passage of so-called “right-to-work” (RTW) laws in Wisconsin was followed by its largest one-year leap in income inequality ever recorded by the ACS.‡ In addition, Wisconsin’s median income growth was less than half the national average from 2015 to 2016 and mean income among low-income households dropped by 1.3%—the second largest decline in the nation. A report from the Economic Policy Institute concluded that RTW laws are associated with lower wages. During the current business cycle, only Wisconsin’s top 5% have done well. The remaining 95% of Wisconsin households have seen a decline in mean income or growth well below the national average. That these trends in Wisconsin coincide with enactment of RTW laws and other anti-labor measures is probably no coincidence. Meanwhile, the progressive policies pursued in Minnesota have coincided with superior results, both in terms of income growth and mitigating the trend toward rising income inequality. * The conversion to constant 2016 dollars is based on the Consumer Price Index (CPI). †The difference between the 2016 Minnesota and Wisconsin Gini coefficients is small and within the margin of error for these estimates. However, even after taking into account the margin of error, it is clear the income inequality has increased more rapidly in Wisconsin than in Minnesota from 2007 to 2016. ‡The first year for which state-specific ACS one-year Gini coefficients are available is 2006; the most recent year is 2016.